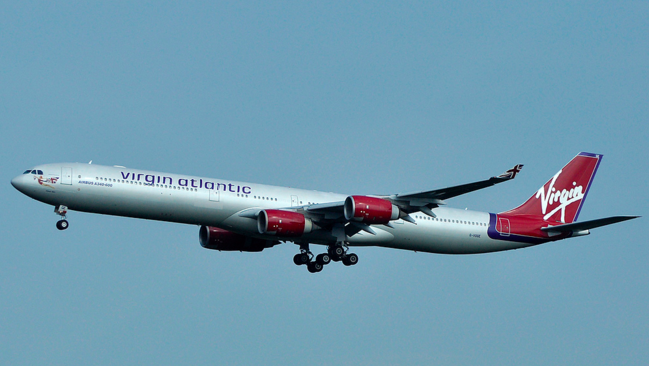 Virgin Atlantic flight 025 had recently left Heathrow Airport for New York when a laser was pointed at the plane, CNN reports. A spokesperson for the carrier says that pilots made the decision to turn around after the incident. The aircraft, carrying 252 passengers and 15 crew members, landed safety. The airline offered affected passengers overnight accommodations and rescheduled the flight for Monday. Virgin Atlantic tells Reuters it is working with authorities to identify the source of the laser, which was reportedly aimed into the cockpit from the ground. A hand-held laser can shoot a small beam of light for more than a mile, lighting up a cockpit and temporarily blinding the people in charge of flying that huge piece of metal carrying human lives safely through the air. In other words, it is not funny, and is in fact, a federal crime in the U.S. Incidents in which laser beams have hit planes or affected pilots have been on the rise recently. In November, the federal investigators said they were investigating after 20 laser strikes aimed at aircraft were reported across the country in one night. In July, the Federal Aviation Administration said it was investigating another incident in which a cluster of 11 lasers hit planes flying near Newark Airport.